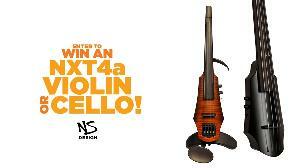 Prize: NS Design NXT4a Violin or Cello ($1,479 - $1,499). What you must do to enter: complete form -- winners outside the US must pay shipping. Statistics: This contest was opened by 156 and entered by 18 ContestChest.com members. 12% of those who opened the contest, entered it.